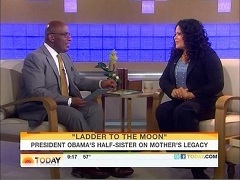 In an interview with President Obama's half-sister Maya Soetoro-Ng on Tuesday's NBC Today, weatherman Al Roker wondered: "When you look back on the President's campaign of hope do you see that - is it still that same message or has it had to change, do you think?" Soetoro-Ng replied: "I think that the message is absolutely the same. The President is still hopeful." Soetoro-Ng was on the show to promote her children's book, 'Ladder to the Moon,' a story about the influence her and Obama's mother, Stanley Ann Dunham, had on their lives. When Roker asked about that influence, Soetoro-Ng declared: "She [Dunham] emphasized the themes that are present in the book - namely that we are interconnected, that we therefore need to take care of one another, empathize with one another, find ways to serve and help one another. And I think that those themes are very much evidenced in this presidency and in all of my brother's efforts as well." Roker later followed up: "Do you see her influences in the President's policies at this point?" Soetoro-Ng asserted: "Most assuredly. There's a balance between negotiation and action and in everything that he does to reach out, in spite of enormous challenges to keep working with people across the aisle. I think I see her every day." As part of her response to Roker's question about Obama's "hope" message, Soetoro-Ng further argued: "There are wonderful and powerful things happening in every corner of this country and we've managed to make, I think, tremendous progress in so many ways. And I think that the hopefulness includes a touch of, you know, pragmatism, sort of hard work and service." Near the end of the interview, Roker worried that despite Obama's announced 2012 re-election bid, "people like Oprah haven't said they're going to endorse him again." He asked Soetoro-Ng to offer some words of encouragement to potential Obama supporters: "If people are on the fence, what do you say to them about 2012?" Soetoro-Ng proclaimed: "I say let's take a really careful look at the fact that we have had a really challenging time in recent years and that given that, my brother has been an extraordinary president. And I'm so tremendously proud of him. And he's going to be an extraordinary president for six more years." AL ROKER: President Obama once described his mother as 'very grounded with a certain recklessness.' Her approach to life, no doubt a formative influence. President Obama's half sister, Maya Soetoro-Ng, grew up with the man who would become president and remains close to the First Family. Well, she's now written a children's book dedicated to their mom, called 'Ladder to the Moon.' Maya, good morning. ROKER: First of all, let me say, it is a beautiful book, it's a lovely story. ROKER: It's gorgeously illustrated. Your mom, Stanley Ann Dunham, is obviously a big influence in this book. How much of her influence forms what you do today? SOETORO-NG: I would say a great deal. I mean, she was a teacher at all times, even though she may have been employed in other ways. She'd spent a lot of time in micro finance, but she was always a teacher and - as am I. She emphasized the themes that are present in the book - namely that we are interconnected, that we therefore need to take care of one another, empathize with one another, find ways to serve and help one another. And I think that those themes are very much evidenced in this presidency and in all of my brother's efforts as well. ROKER: Hands-on mom. You say she was a real hands-on mom and a great storyteller. What - if you had to pick one important lesson she would impart to you, what would that be? SOETORO-NG: That kindness is of such value and is often underrated, basic human kindness. And she was formidable in some ways. And when it came to work, she fought rather fearlessly for those, you know, about whom she cared. But she was also very tender and very sweet and there was a softness about her. And I think that she made everyone feel like it was okay to be complex. ROKER: Do you see her influences in the President's policies at this point? SOETORO-NG: Most assuredly. There's a balance between negotiation and action and in everything that he does to reach out, in spite of enormous challenges to keep working with people across the aisle. I think I see her every day. ROKER: In 'Ladder to the Moon,' it's - there is a message of hope in there. ROKER: And looking forward and also looking back. When you look back on the President's campaign of hope do you see that - is it still that same message or has it had to change, do you think? SOETORO-NG: No, I think - I think that the message is absolutely the same. The President is still hopeful. I certainly am. There are wonderful and powerful things happening in every corner of this country and we've managed to make, I think, tremendous progress in so many ways. And I think that the hopefulness includes a touch of, you know, pragmatism, sort of hard work and service. In the book it's really about Suhaila, my daughter, and our children everywhere, remembering that they are strong and that they can help and beginning to sort of act in finding a language for service, even at a young age. ROKER: You still live in Hawaii. ROKER: And I know that the President maintains close ties to Hawaii. ROKER: How difficult is it hearing people like Donald Trump saying they don't believe the President was born in Hawaii, that there's an issue there? What does that - what goes through your mind when you hear things like that? SOETORO-NG: Well, I think the facts are absolutely clear. I think that not only do we have newspaper releases showing his birth, the birth certificate has been authenticated by a number of sources, including our Republican former governor. So I really think there's no more to it than that. He was born in Hawaii and that's a fact. ROKER: And you mentioned your daughter, Suhaila, and this book is inspired by her. what inspires you today? SOETORO-NG: Well, myriad things. I think that certainly my work as an educator continues to remind me that we are able to shape our own stories and impact our own communities. And the thing that is remarkable about our mother, I think, is she wasn't content to work with just what she was given or handed. That she really built her own story, her own life, and used imagination. And I love that idea of using imagination in as many ways as possible. ROKER: We obviously haven't seen the end of the story for President Obama. Obviously he's announced he's running for 2012. You campaigned for him in 2008, I assume you will again as he runs in 2012. But people like Oprah haven't said they're going to endorse him again. If people are on the fence, what do you say to them about 2012? SOETORO-NG: I say let's take a really careful look at the fact that we have had a really challenging time in recent years and that given that, my brother has been an extraordinary president. And I'm so tremendously proud of him. And he's going to be an extraordinary president for six more years. ROKER: Well, I know your mother would be very touched and very proud of this book. ROKER: It is a beautiful book. Now the book is called 'Ladder to the Moon.' Maya, Soetoro-ng, thank you so much. SOETORO-NG: Thank you so much for having me. - Kyle Drennen is a news analyst at the Media Research Center. You can follow him on Twitter here.